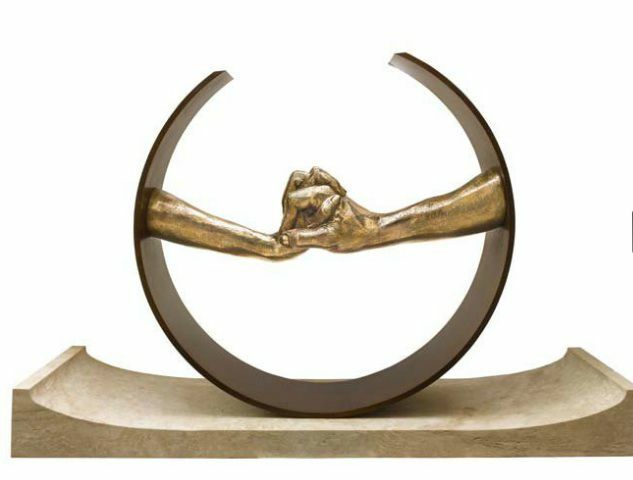 Lorenzo Quinn was born in Rome in 1966 and is the son of famous actor Anthony Quinn. He studied at the American Academy of Fine Arts in New York and subsequently in workshops and foundries across the United States and Europe. Starting out as a painter in 1982, he soon discovered that a dimension was missing from his work. Turning to sculpture because of a deep-rooted need to create, he found this medium allowed him to directly convey his innermost feelings to the viewer. Quinn can be described as a prodigy in the art world. At the age of 21, he was already respected by the New York arts community. He was then selected to head the Absolut Vodka ad campaign, a campaign for which only the top world artists are chosen. Shortly after, he was asked by Vatican to create a sculpture of Saint Anthony in order to commemorate the eighth anniversary of his death. Lorenzo's work is included in many impressive private collections throughout the world, which has lead to a prodigious amount of commissioned work. This includes being commissioned by the Vatican to sculpt the likeness of Saint Anthony, in commemoration of the Eighth Centennial of the Saint's birth. Lorenzo's sculpture was blessed by the Holy Father in Saint Peter's Square before it was placed in the Basilica del Santo in Padua in 1995. He has also been commissioned by the United Nations to produce a stamp for their collection, as well as placing several monumental sculptures throughout the UK and Europe. 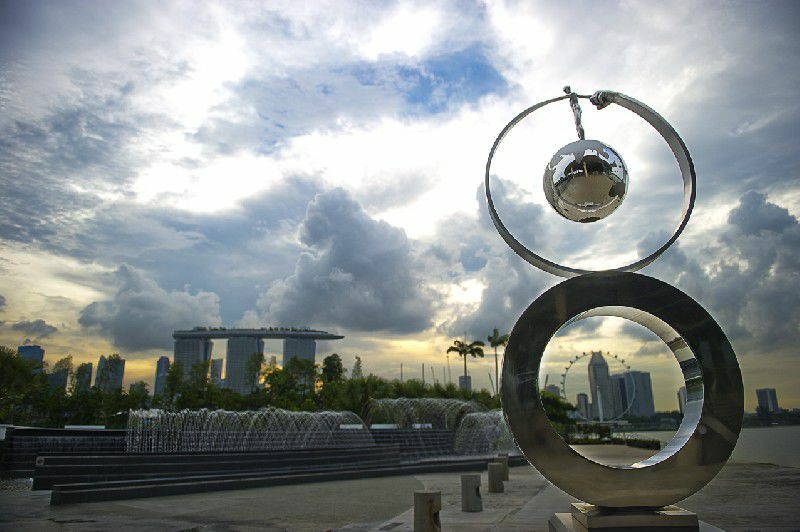 His ongoing project, 'The Globe Of Life' which represents the hundred most important moments in history, looks set to be his most significant work to date, with five monumental bronze sculptures linking each continent. Other than having exhibited throughout the United States, Lorenzo has shown his work in South America, Europe and Asia. In April 2003, Lorenzo's monumental sculpture, 'Encounters', which has been commissioned by Fundatur and donated to the city of Mallorca, was unveiled opposite the Museum of Modern Art in Palma de Mallorca. The artist has continued to undertake both private and public commissions internationally. In September 2009, Lorenzo's dramatic sculpture, 'View into the Future', commissioned by Bacardi, was unveiled in the town of Sitges, Spain. The inauguration of another public commission for the Fraga Council followed in October 2009, in Lleida, Spain. He is currently working on a number of high-profile commissions for public and private placement in Europe and the Middle East. Many of Lorenzo's sculptures often featured the symbol that has become synonymous with Lorenzo's work - the human hand. "The reason I sculpt the hand is because I need to communicate in a universal language, especially since I exhibit in five continents. The use of this hand language helps me achieve this, creating a dialogue rather than a monologue," he explains. "The hand holds so much power - the power to love, to hate, to create, to destroy. I have injected a lifetime of experience into Evolution - it is about my past, present and future." Commenting on his work, Lorenzo says, "It is the viewer that interests me, not the art critic... I make art for myself and the people who wish to come along for a ride through my dreams." Consuelo Císcar Casabán, director of the Instituto Valenciano de Arte Moderno (IVAM), gives her perspective of "You Too", a monumental Lorenzo Quinn installation. From the moment I became part of Lorenzo's You Too project, I immediately associated it with a fragment from one of the most representative works of art in its entire history: The Creation of Adam - Michelangelo's Renaissance fresco, which continues to amaze visitors of the Sistine Chapel. As is widely known, this painting represents the biblical episode in Genesis where God with his index finger, gives life to Adam. 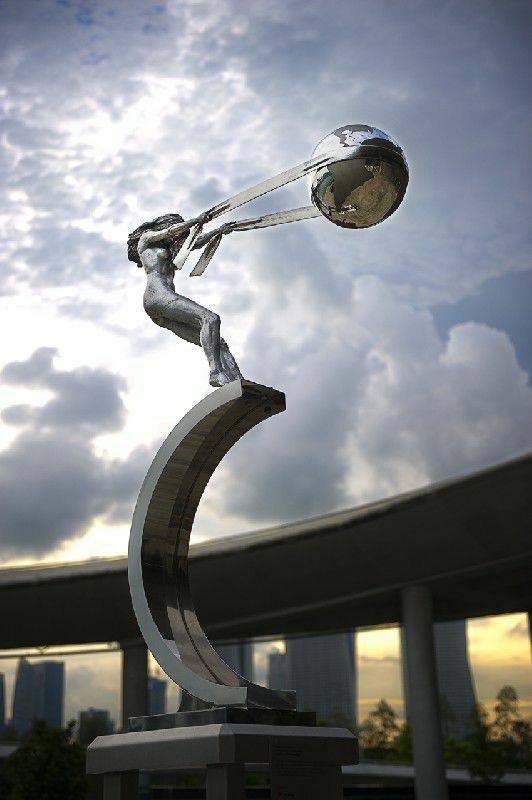 It is of no surprise that Lorenzo Quinn's colossal sculpture reminds me of that universal scene found in the Vatican. It carries that Renaissance taste for anatomical sophistication, its detail, precision and humanism. At the same time, You Too convincingly invites the spectator to become part of the art and transform himself into a new man. In this respect, this piece, like the work of Michelangelo, also refers to the 'creation' as it inspires a new way of participating and integrating within society. According to Quinn, it is the defiant and provocative index finger that has the most power in the human body. This is due to its capacity to destroy and create and demonstrate love and hate. That is why Quinn uses this reference to capture every aspect of our daily routines. In this context, the artistic statement seeks to generate social activity by offering the visitor a different point of view. You Too is, therefore, an installation that expresses the spirit of participation, democratically integrating social networks and all cultures around the world. This work represents the rise of equality in society, owing much to the new domestic tools we have at our disposal in this digital age of information and knowledge. In this way, this new, inclusive digital era places value on the convergence between aesthetic and intellectual works. For this reason, You Too presents itself as an iconic work of art, which given its dimensions, will point at the visitors entering the museum and create life, just like Michelangelo's deity. Except that on this occasion, life will be created by its relation to art. In my personal view, life and art are integrated in You Too, where people will be enriched by the art and also be able to identify with each other. There has long been a tendency to consider sculpture solely from a formal angle, looking at the technical evolution it has undergone through the centuries rather than the various elements that have informed its history since ancient times. This school of thought, in evidence since the Renaissance but with its roots in classical sculpture, has been the norm by which sculpture has been guided. It has consisted primarily of a hyper-real representation of an object; representing it mostly as an isolated element, or placed within a credible context, or very close to reality. For much of its secular history, sculpture has attempted to idealize man and the world, although both man and world were always immediately recognizable, the aim being to present the onlooker with a tangible reality. Contemporary abstract sculpture has emphasized the same thing, limiting itself exclusively to showing another reality, yet one not essentially different from the formal beauty attempted by the anonymous sculptor of the hieratic figures of Chartres cathedral's west facade, or achieved by Michelangelo with his David, or experienced by Rodin with The Kiss. In the history of sculpture, however, there have been artists who have pursued another discourse more commonly expressed in the world of painting. I refer to all the anonymous medieval sculptors who resorted to the descriptive quality of sculpture to narrate didactically the imposing tension of the final judgments, the horrors of hell and the wonders of paradise. Their sculptures populate the tympanums of innumerable Romanesque and Gothic churches throughout Europe and other corners of the world, and in them poetry carries the same weight as the material in the scale of men's values. Palaces and temples were built in which the sculptor fashioned ideal worlds very differently from the far less beautiful and comfortable everyday reality that was, on the contrary, often horrible. All these artists were capable of realizing the corporeality of dreams, and Lorenzo Quinn belongs to this species of sculptor. It is not that Quinn fails to nurture the formal in his pieces. Neither does he renounce in any way the historical legacy to which he owes his development (I see Donatello as a greater influence than Buonarotti. Nor does he abandon the craftsmanship of his work, resolving the sculptures with a characteristically clean and perfect finish. The fact is that Lorenzo is not content to be an everyday sculptor, but endeavors to go beyond that, propelled by an interior force refined by a mixture of bloods. He places as much value on the dream world inherited from the East as on the Cartesian reason, order and constancy of the West. It all courses through his veins in an explosive mixture that engenders the miracle of his sculptures. 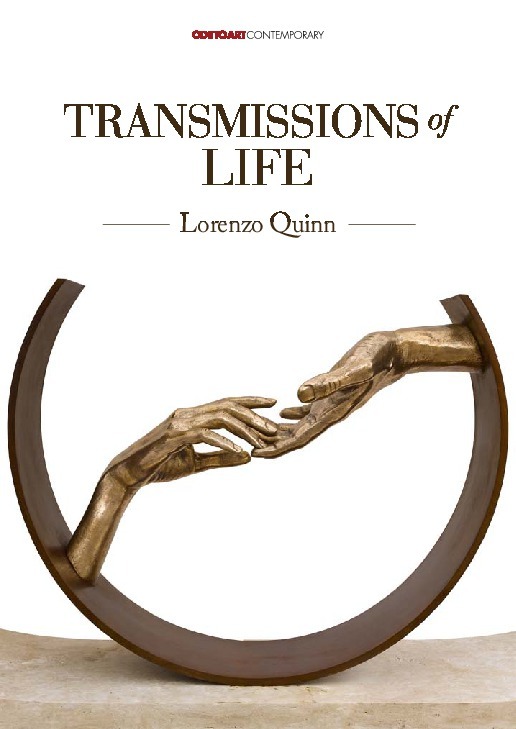 A man of strong religious convictions - just like the sculptors of medieval times - Lorenzo Quinn is the interpreter of his own dreams into a language that, in order to be less cryptic, must be completed with a textual appendix which does not attempt to explain the work, but rather becomes a part of it. It is a single and indivisible discourse and it would therefore be absurd to attribute a more prominent role to any one element of it. It is true that a work of art should not be based on rhetoric, nor offer a tedious preface to justify itself, and that is certainly not the case here. The sculptures of Lorenzo Quinn consist of (increasingly diverse) forms and materials, and the titles and lyrical haloes that make up the whole push towards a humanistic utopia in which the artist still believes. The ultimate mission of the sculptor - the man, Lorenzo - the reason he works so diligently in a field that some might trivialize without even trying to understand it, is to help man to evolve a little further through tolerance, understanding and harmony; virtues with which Lorenzo tries to impregnate his work and all his vital acts with. Patrolling utopia, Lorenzo demands that we all participate in the miracle and longs for the communion of the onlooker. His desires are the sole means for attaining that end. This is, he thinks, what will ultimately justify his work, failing to realise in his generosity that were he not to achieve his aim, his art would still be here for us to enjoy, neither realising that this clear goal is far away and will be reached by milestones still to come; milestones that have been set up by the anonymous master of the Saint Foy de Conques tympanum and by Lorenzo himself, among others and for all those who have been capable of giving corporeality to their dreams. Lorenzo Quinn was born in Rome in 1966 and was the son of the famous actor ANthony Quinn. He studied at the American Academy of Fine Arts in New York and subsequently in workshops and foundries across the United States and Europe.